Thought you missed out on seeing That’s (un)Australian! At this year’s comedy festival? Well you are in luck as the team have gathered together and arranged to do a special one off (unless it sells out) encore show at Sydney’s home of comedy the Harold Park Hotel. Friday July 7th at 7:30 pm. 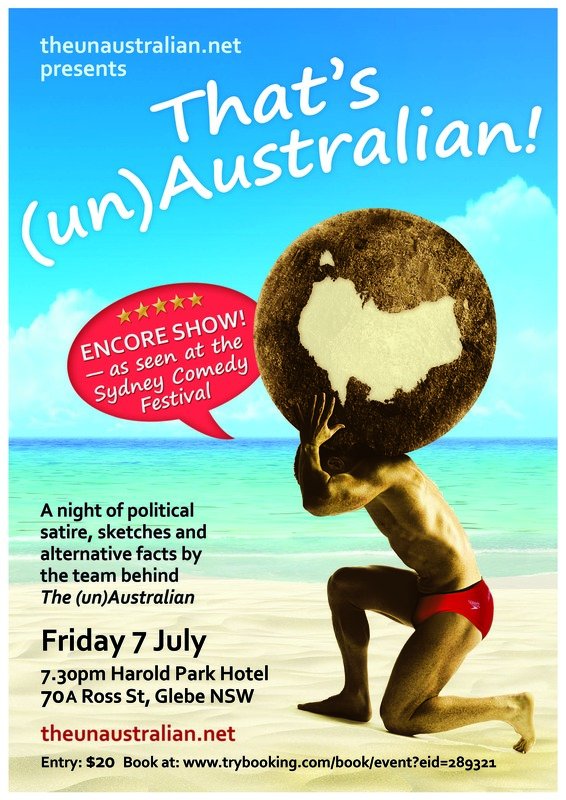 So gather your friends, get a coup together or even invite your foreign backers along to see the critically acclaimed smash hit of the Sydney Comedy Festival, That’s (un)Australian! To buy tickets please follow the link below. *Andrew Robb and Sam Dastyari we will not put either of you on the door so please stop asking for tickets for you and your defamation lawyers.